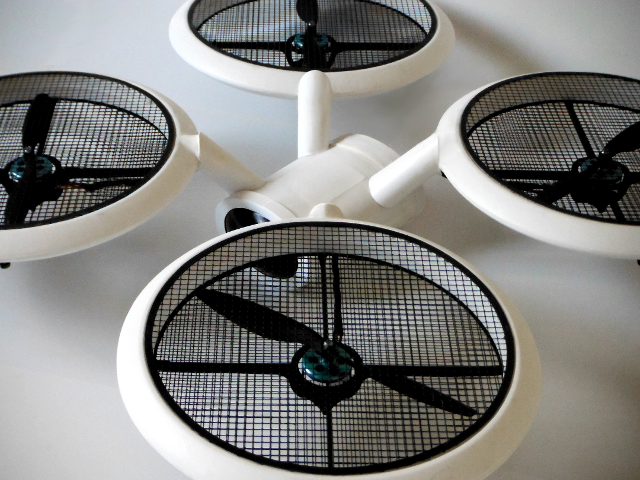 A number of drones these days like the one shown in the picture below have fully protected multi-rotor propeller guard system . These are lightweight, aerodynamic housing that keeps these spinning knife-blades away from people's fingers, trees etc. In general, having a shroud (a duct actually) over the propeller reduces the tip losses; however, in an UAV, this effect is pretty small (and requires tight clearances) in order to have any practical effect. Also, if the ducts are not designed properly, the flow entering the propellers may be affected, reducing the performance. The main disadvantage is the weight- the shroud and the support structure will affect the performance adversely (also, there is some increased drag) and is usually not recommended. For an UAV having endurance of mere minutes, the effects can be substantial. The main advantage is safety- the propellers are safe from hitting the ground and getting damaged; so if you are reasonably confident of your flying abilities it is better to go without a shroud, rather than with one. Another thing is that the addition of aftermarket shrouds to UAVs have to be evaluated carefully- the weight may alter the flying properties appreciably (for e.g. the descent rate), so one has to be careful. Remember the drag contribution of a biplane's bracing wires? Now this quadcopter has not one, but two screens in the flow path of the propellers. Each thread of the mesh will act like a small bracing wire and reduce propeller efficiency considerably. In comparison, the shroud has relatively little impact. Tip clearances are too big and shroud size is too small to improve propeller efficiency measurably, the drag in forward flight should be manageable and the worst contribution of the shrouds is probably their added mass. But it all pales in comparison to those two layers of mesh! Aerodynamically, one can say that those prop guards create some kind of Fenestron (Like some tail rotors in helicopters), which will reduce the tip losses of the propeller. On the other hand, they will increase drag in forward flight, reducing the UAV top horizontal speed. If you take a look at the Aibotix X6 you see a one piece prop guard designed aerodynamically to reduce drag in forward flight. In the particular case of your image, the black web also decreases the area of air flow into the propeller, certainly reducing its efficiency. Another prop guards disadvantage is the weight they add. Even though they might be made of lightweight material, they have to have some strength to resist any impact. To sum up, with a prop guards like those, you should loose top speed and around 2 minutes of flight time. Not the answer you're looking for? Browse other questions tagged aerodynamics unmanned-aerial-vehicle or ask your own question. What aerodynamic data exists for the Yak-130? What is the physical explanation for the formation and position of stagnation points on an object moving in a fluid? What is the effect of airfoil thickness on aerodynamic lift? What software is used for aerodynamic wing shape optimization?